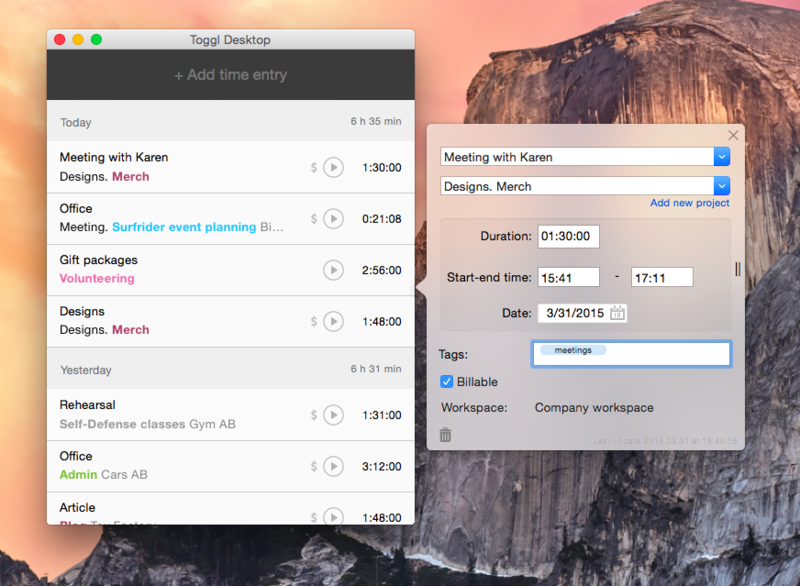 Toggl Desktop for Mac is a native OSX application, that can be installed on your computer. It works seamlessly with the web version of Toggl, syncing data on the fly. 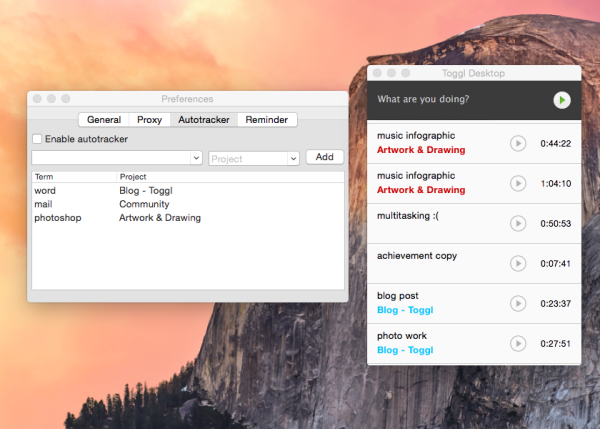 Toggl Desktop works also offline, it stores data locally and sends it to the Toggl server once you’re back online. 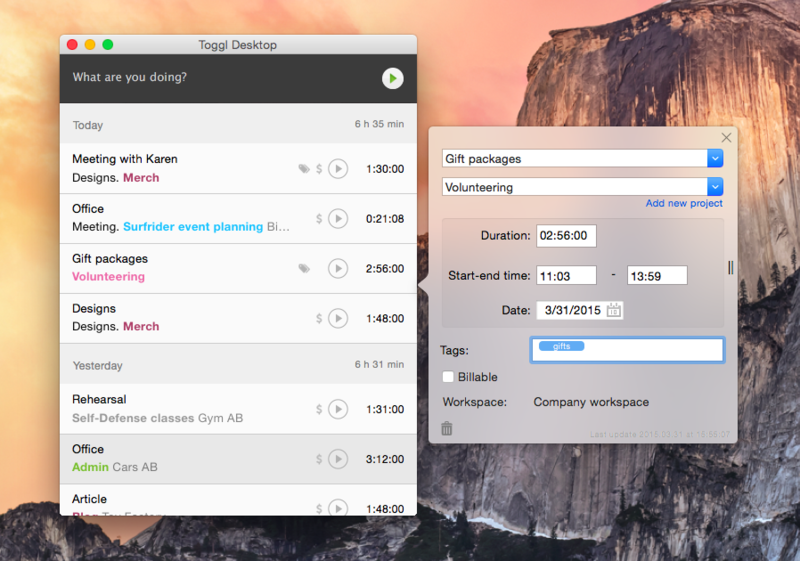 Toggl Desktop is also available on App Store! 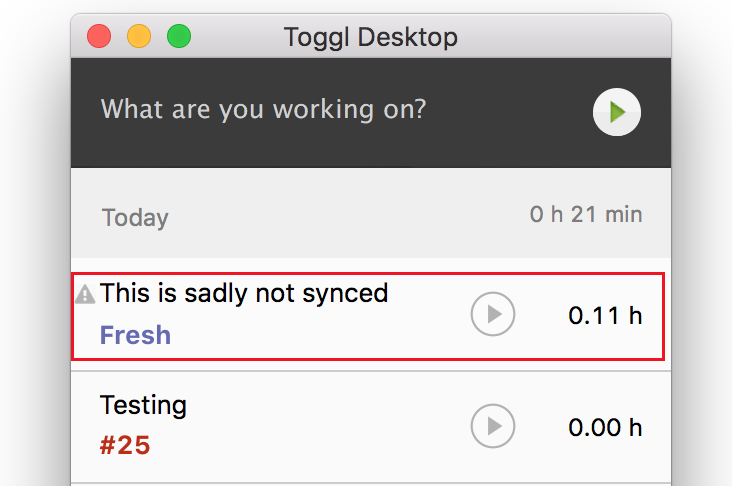 If you feel that you like the app store update system more than the current automatic updater, you are more than welcome to switch to the App Store version of Toggl Desktop. 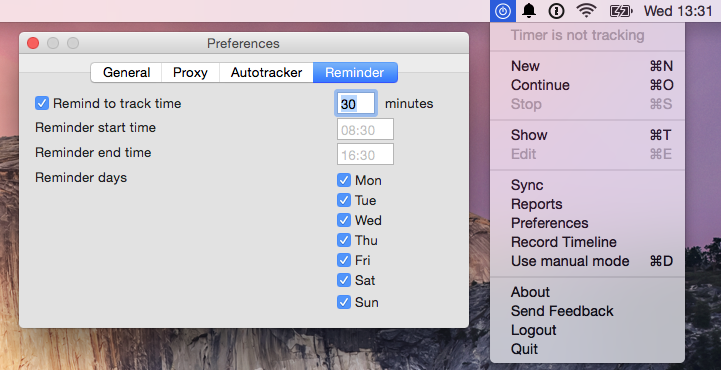 Tracking time with the desktop agent is as simple as it could possibly be. Just fill in the details of the job you’re doing and click on the green “play” button to start the timer. If you start the timer first and wish to add the details later, just click on the timer and a popup window appears where you’re able to edit the description, start/stop times and the project. You’re also able to add tags and decide whether the entry is marked as “Billable” or no. To make your life easier, the Toggl Desktop icon in your dock turns red when the timer is running, and grey, when it’s not. The same applies in the menu bar, but in different colors: black or invisible. The app can display each time entry individually or it can group entries with the same description and project together. This behavior can be controlled by enabling/disabling the “Group similar time entries” option inside the Profile page. For more details about time entry grouping please open the Timer Page article. You can load up to a full month’s worth of time entries for a better overview by clicking “Load more” at the bottom of the list. Toggl syncs all your entries back to the web automatically. However, if there is an issue with the app connecting to our server you may have unsynced entries. You will see a warning next to your entry in the form of a white exclamation point in the center of a gray triangle. If this happens please navigate to Account > Sync. If the sync is unsuccessful please log out and log back into the desktop. To avoid data loss please be sure to make note of any unsynced entries which will then need to be added manually. Editing your time entries in the desktop app has the same basics – just click on the entry you wish to edit and a similar popup window appears. Once you’re done editing, close the popup window. Changes are saved automatically. To continue a time entry, just click on the arrow button next to the time entry. Projects can be added while editing time entries, including the one currently running. In the edit popup window, select “Add New Project”. From where you can define the project name, color, workspace and client. You can also enter the description for the entry you’re editing. When you’re done, click on the X button in the top right corner of the popup. Record timeline – if you tick this option, all websites and programs that you view for longer than 10 seconds will be recorded. You can learn more about this feature here. Pomodoro timer – with the Pomodoro timer you can set up notifications that will let you know that it’s time to take a break. Tick the ‘Pomodoro Timer’ option to enable it and set your preferred interval. Default project setting allows you to pick one project that you use the most. This project will be automatically filled in each time you start a time-entry without a project. If needed you can still change the project for both running and stopped time-entries. 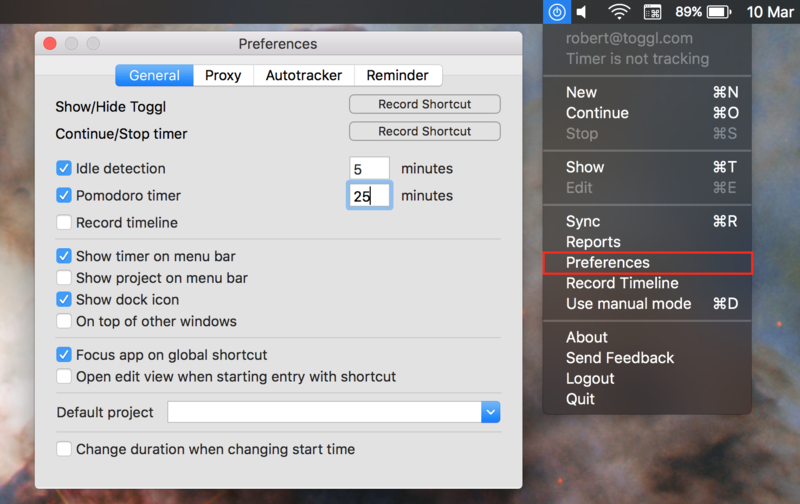 Under the Proxy tab you can configure proxy settings if you happen to be behind a proxy. If you tick the ‘Use system proxy settings’ checkbox, Toggl Desktop will use the same proxy settings you have set up for your system. Under the Autotracker tab you can define applications or keywords and projects they connect to. If an application with the keyword is in the foreground it triggers the AutoTracker. When the tracker is triggered it shows you a notification and asks if you would like to track time under the project you chose. 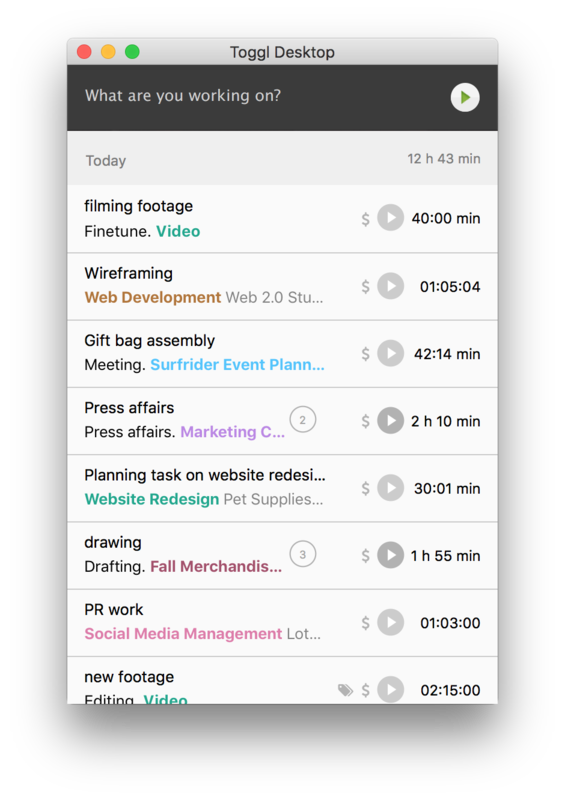 Under the Reminder tab you’re able to customize your tracking reminders. 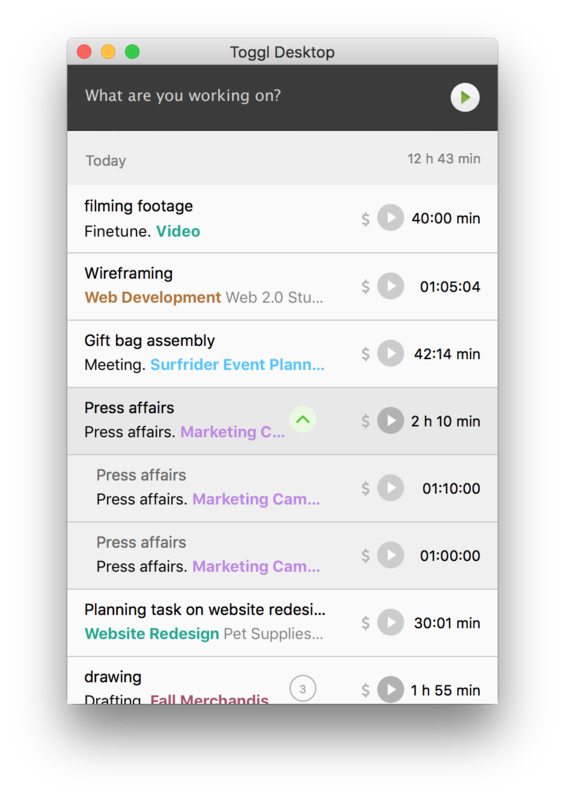 You can choose how often the reminder will pop up; choose the weekdays you want to be notified (no more Sunday reminders!). Also, you can choose the time of day when you want to be reminded to start working. Note: If can't see any notifications from our desktop app, please make sure that Do Not Disturb is off. ESC – If the edit popup is opened it always closes the popup (event if listing is focused). If edit popup is not opened and entries list is focused it will switch the focus to Timer. 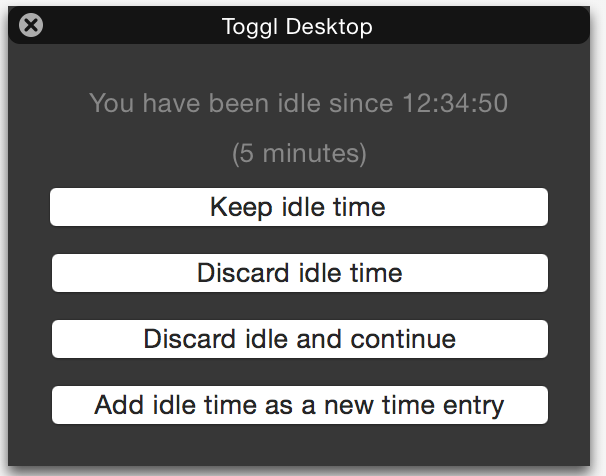 Toggl Desktop is an open source project. You’re welcome to help us by submitting pull requests, bug reports or feature requests to our GitHub page.